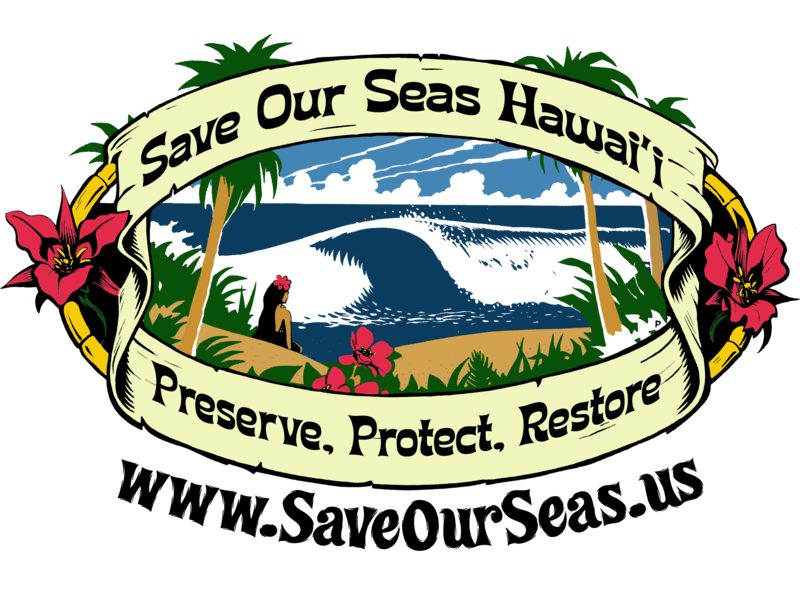 Save Our Seas Hawai’i. We specialize in implementing experiential hands-on education and research to preserve, protect, and restore the world’s oceans for future generations. Scientifically Proven & Culturally Acceptable SOLUTIONS DO EXIST ! Join us for a PRIVATE SNORKEL and reef exploration on the North Shore of Kaua’i with a marine biologist. Learn about the reef and the creatures that live there. Day or NIGHT snorkel. Night is our favorite with flashlights. JOIN US! Call or email for details. Princeville Chaperones – www.Princeville.biz – babysitting and educational childcare for all ages Kauai Hawaii. I’d just like to say thanks to everyone who put together this website, It’s just such a great idea I would love do do something like the ocean pulse project. I’m doing an assesment on ocean pollution and came across your website it’s just great. SOS: Aloha Kate, Let us know if you have a specific questions on pollution. We are always updating or site. I suggest that after identifying source of pollution, quantify it effects through some research this will answer different questions inclunding how much toxic does that pollution account, is it lethal or not at what scale?. conduct biomornitoring in the lake to assess species composition. then finaly law enforcement should be applied . SOS: Aloha Ireland, all waterways lead to the sea. Get your school or community involved in caring for waterways. Every bit helps. I live in London and I want to raise awareness of shark finning and mass dolphin slaughter. Do you know of any English organisations I could contact? I want to do some school talks but need literature. Any thoughts/suggestions? Yes let’s protect sharks worldwide! I hope all is well in paradise. Keep up your good work. Most people do not understand the importance of a balanced eco-system. Friendly farmers in Iowa don’t understand how sharks in Hawaii affect them. All part of an inextricably delicate system. Mother Earth.Best_Chris’ .. SB. Ca. Let me know if you can use some of my books……….check out Who Lives in the Coral Reef……….last page is like your poster! Please don’t touch corals! gotta help keiki learn more about life close to shore, but also have fun doing fun stuff with ocean debris they collect at the beach. See http://soaronhirschi.blogspot.com for some fun ways of fusing plastics to make fish and more! hola: es la primera vez que entro en ésta página. Mi interes se a producido después de ver un programa en televisión española (la 2) sobre las tortugas bobas. Y me a gustado tanto que me gustaría conseguirlo, para enseñarlo, tenerlo como medio de expresión de una educación para adultos y niños. ¿Es precioso! por favor, me gustaría saber como lo puedo conseguir. I like your post. I’ll come back for future posts. Aloha! I have created a group on a website called http://www.stardoll.com (a fashion and social networking site for teens) to raise awareness about what we can do to save our seas – any suggestions or topics in particular in which I should emphasise to give young people such as myself a better understanding of what is happening to the sea and what they can do to help? Hi my name is crystal Knowles. I’m contacting you asking for information about membership, goals and anything else you would like to send me. Im doing a class project and would love some information. Thanks so much. Aloha, thanks for your interest! Check our donate page for membership and also our student link page for great info on protecting the sea. Is there any way we can help the enviornment? The first part is asking the question – good job! then look around where you live and your community for projects and get your friends, family, and community involved! A good example of this could be a beach cleanup – then get the press down there, take pictures, publicize and urge people not to throw rubbish out like cigarette butts! Really appreciate all you do! Hi Paul. Hope all is well. all is great – the whales are coming home – stop by here one of these days! Do you see problems in other organizations? Do you see problems in other organizations? – It takes a big team to help anyone doing good is doing good. Hi Save our seas, I’m doing a political action project in my class. Me and a friend chose beach pollution as our topic and want to help spread the word around our community about the current condition of our oceans. Do you have any statistics I can use? Or other info I can use to convince people of the importance of our cause. I was also wondering if you do public speeches at schools. If you do how would I set that up? Also, we welcome any advertisements that you’d want to send our way to help promote your organization, such as informational fliers, posters, or stickers. Thanks. .. The ocean currents have certain patterns, and garbage accumulates in certain parts of the oceans. The great Garbage Patch is so big, no one knows just how large it is. I know from my visit to Lanai, there was a particular area on Shipwreck Beach where the currents tended to deposit most debris. Perhaps researching & developing an understanding of ocean currents and the most likely areas of deposited debris, will assist in focussing attention on specific areas most likely to accumulate. http://geography.about.com/od/physicalgeography/a/oceancurrents.htm .. ‘Keep up the great work’ our very survival may well depend upon it. The folks at Pew have some great statistics to look to! Yes we do work with schools – where are you located? Being part of our career as a seafarers, the great oceans are now our new home & we are doing our efforts in dealing with the problem of marine pollution. Our contribution to save marine life is to implement Maritime Pollution regulation 73/78 strictly on-board our vessels.. This is of course the most fascinating subject. We protect our oceans. Such a delicate ecosystem. While others send Supertankers with oil and Nuclear ships in the gulf. We live in a very delicate time. ‘To Be or Not to Be’ .. ‘Shakspeare’ .. What happens in the middle East will affect the entire world. There must come a time to stop this madness. It will take a firm hand. i live in a small town i have recently moved but i still notce the pollotion in a nere by creek and the ocean. also i wound like to sart a web site could you explane to me how. i think to hand out fliers at school would donate and help raise money and awarness please replay. please organize local cleanups with your school or community to help! You can find website instructions in many places like google. Is there a presentative in Durban South Africa that I could speak to directly [ face to face ] I have an idea that would _provide a fulltime income in the millions for Save our Seas Charity [in conjunction with The Endangered Animal Charities } and employ several thousand people ? Yes that information was released the other day .. I find it totally amazing and disgusting, but that is our reality’ ..
As I mentioned I did some research on BPA awhile back. But is as clear as the nose on my face, GOV. agencies like the FDA. Most research organizations will not do any research related to BPA. Their funding will be cut off., immediately. Labs, advanced Nuclear research and design. It could actually be in the ‘Trillion Dollars’, not Billions. If it was determined that BPA. exposure was as harmful as some of understand. The lawsuits for so many illness’s, and deaths would be incalculable .. It would decimate many large Corporations, and bring down Insurance Co.’s ..
and mass murder .. Much like War Crimes. So you can see just how big this is. As I mentioned previously, BPA. is a highly toxic bi/product of oil production. I also talked about the astronomical rise in Autistic children. I firmly believe it is related to BPA. Many honest scientists and researchers have confirmed this. The most immediate effects of BPA. are apparent in Fetus’s, and babies. Brain disorders, neurological damage etc. It is possible BPA. may actually alter a fetus DNA. I hope you find the time to read this, and think about it. We would like to thank Mary Lou of SOS for her help today! She came in a timely manner to assist in saving a beautiful albatross we had found hit by a car on the side of the road. She knew how to handle the bird appropirately and did an excellent job counseling those of us who were worked up by the whole expirence. Mahalo Mary Lou & SOS! That is so cool. I remember years ago, I was flying my hang glider, when California released the only 6 remaining Condors. They flew by my wing. Imagine only 6 remain from an entire species’ ..
We are an new not-for-profit social enterprise based in Cambridge, UK, and we are looking to work to create a stronger network within wildlife conservation. Our aim is to provide advice and support to organisations that could benefit from the intellectual resources available in Cambridge. We hold bi-weekly events, during which we bring together a range of academics and professionals involved in wildlife conservation, and collaborate on solving problems faced by other organisations in the field. I wanted to see if your organisation might benefit from our work, and if you’d be interested in sharing a few problems faced by your teams that we might be able to collaborate on? If you consider this as a potential opportunity, or know of an organisation that might, please do get in contact or forward on our details. Thank you for your time. I look forward to hearing from you in the near future. hello, this looks like really interesting and great work that you guys are doing. i came across you in a search for possible allies, and am only posting here, because i can’t find an interface to message you privately, i hope no offense is taken by me listing our cause here.Here is our indiegogo campaign. With this new story we continue to add our puppet activism to the already powerful voice opposing tanker traffic in our waters. Specifically they want to increase the number of vlcc’s in our water by over 300 a year. These monsters, carrying diluted bitumen, will always be either coming and going. We Haida are a wealthy people, not rich but, we are able to live off the bounty of the sea. Pick seaweed and k’aaw in the spring, fish the rivers and sea through the summer, cockles and scallops come with the winter storms. So you can see that the prospect of increased tanker traffic in our waters is of real concern to us. Those tankers don’t just represent the dramatic threat of spills. New species that can devastate a sensitive ecosystem can piggy back in their bilge as they traverse the planet, and there is the steady trickle of pollution, dribbles from what they carry, but also just the grease and fuel that keeps their machinery going day to day. A threat to sea life as their massive hulls will be navigating the narrow channel up to the transfer station. And a risk of collision with large mammals, especially whales. Haida take our role as stewards of the land seriously. This proposal is a threat to our way of life, let alone the lives of the other creatures that we share these waters with. The new story in Haida Raid 3 is the battle against tankers. It will also carry a message of unity. There have been some discouraging developments in our battle, but there is a solid wall of opposition all along the coast. Through the lighter nature of this puppet activism we hope to draw attention and good will from further afield than those directly threatened by this project, as well as bolster the spirits of those of us who are. And share a little information while we are at it. This is our previous animations. In Haida Raid 2 we deal with the threat of pipelines. Dean Lyon, Visual Effects Supervisor for the Lord of the Rings trilogy, will Skype-in via video call to Lydgate Park this Tuesday night. “Through the wonders of technology,” said Lyon. “I have been touched by the community of Kaua’i, and I am excited about the opportunity to collaborate and share a positive and insightful, visually compelling story about the state and purpose of our sacred coral reefs to the entire planet.” During Tuesday’s forum, Lyon will be discussing his vision for helping to bring this important message to the world through the eyes of nā keiki, and the wisdoms of Hawaiian people. Kaua’i consultants Nā Hōkū Welo will help navigate this Mission through their knowledge of Hawaiian culture, history, language, ʻāina-based genealogy, education and multimedia. Nā Hōkū Welo and the High Tech Youth Network are currently co-collaborating on several Kaua’i projects, including a holographic Moku exhibit for the Kaua’i Museum. Additional guidance will come through a Native Hawaiian Board of Advisors. The funding for the feature film documentary will be raised through angel donors and worldwide crowd funding sources. Donations for this non-profit documentary will be made through the Kaua’i Museum, who will manage the funds through a transparent process. All proceeds for this film will benefit programs focused on remediation, restoration and sustainability. Prosperity For Humanity, a Kaua’i organization, is coordinating this pot-luck, family friendly event that will be held at the Lydgate Park pavilion on Tuesday, July 29th, 6:30-8:00 p.m. Danny Hashimoto will emcee this forum, and Dean Lyon will take questions from the audience. For more information contact: ponoprosperity@aol.com.